Alright let’s pick right up from where we left off last week. As I said there the first 20 levels felt very linear as far as the story and the world go, though the sheer amount of things to play within within your character are the exact opposite. As you climb in levels you gain new abilities, most of which you’ll automatically jump on using but right around level 15 you have to start making choices. The choices are great because you want to be able to use all of your abilities but you can’t so you’re really trying to pick and choose the best one for the job at hand. Partying with friends? Pick a set of powers that is going to benefit your strengths/weaknesses the most. Are you fighting lots of monsters that are quantity over quality? Maybe it’s time to break out that AoE power you have. Soloing? Bring your companion. As you go through those 20 first levels the game presents itself to you in bite sized amounts of nuance – teaching you about the UI, different types of resources you can use and expanding your possibilities within the game world. The story starts to branch out it seems toward levels 19-20 and starts introducing some of the spell plague plot elements but I honestly can’t say more than that because I didn’t get to play much farther. Let’s drop back a bit to the character creation and discuss the races, classes, and all of those other great D&D bits we all know and love. So the beta gave us access to humans, elves, dwarves, halflings, half elves, half orcs, and tieflings. Of course the founders will have access to the Drow race and more will come down the pipeline after the game launches. I will say that the level of customization for each race was beyond what I expected, more comprehensive than most MMO’s I’ve played. I’d put it on par with Elder Scrolls or Bioware level of detail tweaking. If that’s what you’re into there is plenty of that here. Each race definitely feels very distinct and has a solid look carved out for them, though I can’t speak for the half elves because I didn’t poke around with one but c’mon and use your imagination there – It’s part elf, part human. Each race has a set of racial bonuses ala tabletop D&D, where you’ll be able to get a +2 to one stat and an optional plus two in a selection of two others. Unless you play a boring human of course. You “roll” for your ability scores and can roll them as many times as you want but it still seems like it’s set up to produce results from an array, no matter how many times I rolled I couldn’t achieve more than one score of 18 in a stat. Not a big deal, there would be huge balance issues if it was purely “organic” like the 4d6 method of making characters in pen and paper D&D. I believe each race has a skill associated with it but I could be wrong, that might have just been the classes, which would kind of make sense I suppose. Speaking of the skills – allow me to explain how those work in an MMORPG. From what I can tell certain skills are given interactable objects within the game world. Little tables full of ancient books and baubles give way to caches of items for those with Arcana, Shrines and statues for religion, Gatherings of moss and mushrooms for nature, and discarded satchels/backpacks for thievery. Not sure why you’d need thievery to steal someone’s backpack but hey, whatever. I was not entirely sold on this to be true, it just seems like a topical way to plug in more things to loot and tie it to a D&D trope. There are also “kits” which are consumables that give you a chance to interact with one of these items if you don’t posses the needed skill, depending on the situation you have a certain % chance to fail and your kit will “break”, consuming it. However as I played more I did learn that skills also come in handy for things like disarming traps (traps in this game are legit), and sometimes the skills will allow for the manipulation of a door or lever that will gain you access to a separate area, which usually results in a treasure chest of some sort so it’s more of just a roundabout way of doing the same thing. Then again, the core of MMO’s is about killing things and taking their loot, or getting loot from treasure chests so take it as you will. It’s not a complaint but I do think there’s a lot more they could do with it, and perhaps they have and I just didn’t get that far. Anyway back to character creation. After you pick your race, you’ll obviously pick a class. During the beta weekend that I played there were 4 classes available: Guardian Fighter, Trickster Rogue, Control Wizard, Devoted Cleric. Each has a very distinct feel to them and I think they will be releasing more classes post launch and it seems they are going the D&D Essentials route of [Type]Class. I suspect we’ll see some kind of striker (DPS) wizard or sorcerer, and a cleric that is more melee oriented than the “laser cleric” that is the devoted one. I played all 4 classes at least to level 10 (sans Cleric) but I played the rogue to 19 so I’ll give you my quick breakdown of how they “feel” and comment on how they feel as part of an adventuring party. The solo capabilities of each class is quite good so there’s no need to comment on whether they can solo, but rather how they do it. Rogue – Very strong solo capabilities, though the game tends to throw bad guys at you in groups of at least 3 or 4 at a time. Depending on the situation and the level of your enemy you’ll likely chug down a health potion or two when faced with 4+ opponents by yourself. As the member of a group you’re great at focusing down a single target at a time and are very mobile so you can dart all across the room with your various encounter powers picking people off and helping peel bad guys off the squishy wizards. Playing the rogue was very very satisfying and combat never felt like a bore, the active maneuvering is very fun to play with by dodging enemy attacks and just being all over the place in general. Fighter – The fighter plays like the tank it is supposed to be. I played a dwarf and boy oh boy did I feel like my little dude could take some punishment. The fighter doesn’t have any active abilities to dodge out of the way like the other 3 classes (which is good) and instead has an active block. You hold shift down and he raises his shield, while in this mode you can’t attack but you take considerably less damage. This pits the fighter against huge foes and really enforces the damage sponge mentality of the guardian fighter, it’s great. To choose to block or to build more aggro or to just get another sword swing in again? Decisions! They have a cool intercept style ability too which makes for great ways to leap into a bundle of foes to get their attention, or to save one of your other party members’ asses. Cleric – The cleric was the first time I’d ever played or heard about people playing a healer in an MMO that were actually excited about it. You don’t just sit around and stare into whack-a-mole health bars and fall asleep at your keyboard. The devoted cleric actively participates in battle by tossing out seals to heal the party, obliterating undead, and slinging lances of faith into enemies at a constant rate. It’s pretty fun, but I won’t say much more because my cleric actually only got to about level 6. 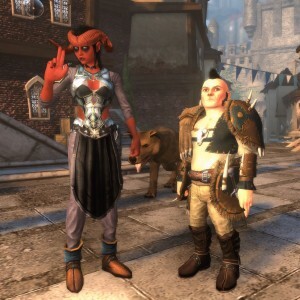 Everyone in Neverwinter has the same shoes. EVERYONE. I do have some small gripes about all the classes though, it seems there was only 1 weapon each one could use. Though my rogue did get an axe toward the end, wizards use orbs, fighters use swords, etc. It felt very limiting but it could be that it’s still a beta, or I wasn’t looking hard enough, or I just got unlucky with drops. I think that the weapons you wield have something to do with your character’s general animation, which can get annoying. The wizards all constantly walk around with their two fingers up (controlling the floating orb? scouts honor?) and the clerics are always holding an arm out dangling their holy symbol around. Looking at them just makes my arms tired. The rogues do this little jump back and forth the way boxers do when preparing for a fight, which is actually kind of cool. Minor gripe but yeah, I wish they’d just stand still! Speaking of PvP, there’s an exclusive press only PvP event going on in Neverwinter tomorrow the 19th and I’m going to get to be part of it! We’re being leveled up to 31 and being shown around the PvP scene! So I’ll be streaming between 3 and 5 pm PST if you want to check out the coverage over on my twitch channel, be sure not to miss it! So, what is leveling and questing like? It’s pretty streamlined, as noted before it may be a bit too streamlined for some people but to each their own. The questing system has a built in tracker. You can make notes on your map, flag areas on your map, and each quest has a highlighted quest zone so you know exactly where to go. There’s also a trail of rainbow sparkles ala Fable that will lead you by the nose to your next objective. You can easily disable this stuff with the stroke of a single hotkey if you like to explore more than you like to be caught up in an endless tutorial. I will admit though I did have it turned off 90% of the time it was great for when you got in a pinch and had no idea what/where the hell it was you were supposed to be doing/going. Getting a level up brings about a pop up for you to basically go through a check list of all the things you can do for that level advancement. The whole game has an overlay that can be triggered via mouse click or key combination, which is an elegant solution for a game that involves a constant use of mouselook. It might take a little getting used to for the first 10 minutes or so but after that you really start to appreciate the UI. Fiddly bits about the game are always a point of contention for me. Am I going to be playing inventory tetris? How quick do I run out of bag space? How easy is it to split stacks of items, trade, converse, manipulate objects, etc. In Neverwinter most all of the things I just mentioned are handled with the F key (rebindable of course) you use it like an action key in other games. 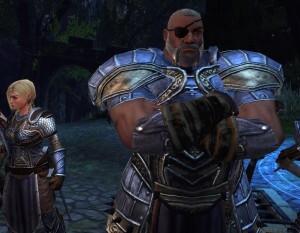 The same way E does most actions in a FPS, F does the same in Neverwinter. It may sound awkward but it felt really really ergonomic during gameplay. I got some footage of inventory management, if you’re as boring as I am you may enjoy it. The dungeon queuing system is really slick. You put yourself in the queue and right there on the screen it tells you the ETA on running the dungeon and an estimated wait time for when you’ll be entering. It uses a system similar to WoW where if a party member drops you can look for someone to fill in on the fly. During the beta I got to run The Cloak Tower and our group had no true tank actually, we used the wizard’s fighter companion as a tank and it did a decent job up until the final boss. Our cleric admitted that they did not know how to heal (I died a time or two) but we managed to get through it. Our party composition was 2 rogues, 2 wizards, and a half cleric and we managed to make it through in about 35 minutes so I’m not sure what that says for the difficulty of the content or if we just got lucky or if since it was an intro dungeon if it wasn’t really meant to be much of a challenge. Regardless, the experience was fun, the run was quick and colorful. That’s one thing I’ll say about the game over and over is that the environments are really varied and it doesn’t just feel like its all open fields and boar slaying. This is a good thing. If you want to watch the whole dungeon run in its entirety, you can do so right here. Enough! Just Grab This Beta Key and Find Out For Yourself! I could go on and on about so many more things, the more I write the more I realize I could be writing about right down to the keybinds and quest givers themselves. I’m not going to press into 2500 word territory though. I’m sure you’ve heard enough of my babble and want to try the game yourself anyway? Logitech is giving away keys for this weekend so go grab one and find me in game. Check back later this week as I have my final wrap up regarding who Neverwinter feels to a D&D player, and perhaps to a DDO player.